Talk about an impact player. 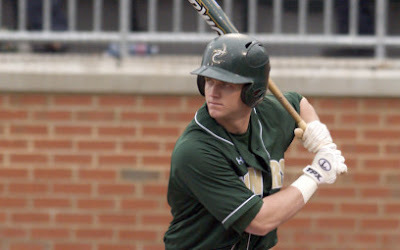 Two seasons after transferring to the Charlotte 49ers following a disappointing freshman season at Campbell, junior Rob Lyerly is moving again. This time, however, it’s up to the professional ranks. Lyerly, a former standout at Unionville Piedmont High, was selected in the sixth round of Wednesday’s Major League Baseball amateur draft by the N.Y. Yankees and barring any unexpected hitches his next assignment will be somewhere in the Yankees organization. “It was a crazy morning talking to all these different teams. I was on the phone with another team that was interested in me when my name showed up in the sixth round,” said Lyerly, who was named first-team all-Atlantic 10 in his only two seasons in the league. Lyerly said he received a call from the Yankees organization Wednesday congratulating him. He expects to get additional details from the within the next few days. Lyerly was the eighth player in school history to bat .400 or more for a single season (.401). He led the team in batting average, doubles (18), slugging (.725) and on-base percentage (.493). He missed 12 games due to injury and finished second in RBI and third in hits. He played first, second and third base due to injuries on the team, committing only two errors in 364 chances. Lyerly is highest drafted 49ers player since pitcher John Maine was taken in the sixth round of the 2002 draft by Baltimore. simply awesome. One other note: he was the first INF the Yankees drafted this year. Yankees and Lyerly RULE ! !